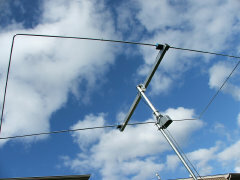 SE1720M Moxon antenna for 17 or 20 Meter operation. 2 Meter Moxon Beam antenna that covers 144 to 148 Mc. at 1.5:1 or less VSWR. Covers 141.5 Mc.to 151.5 MHz at less than 2:1 VSWR, providing coverage of CAP frequencies too. Constructed of 1/2" and 3/8" hard drawn 6063-T832 aluminum tubing, 6061-T6 aluminum, UV resistant PVC, and stainless steel hardware. Comes with a 1:1 Guanella current balun with a choice of a UHF Female or Type-N Female connector. Stack two with a phasing harness to gain +3dB of additional gain. Click picture for ordering and additional information. 20 meter Moxon Beam that covers 14 to 14.350 Mc. at 1.5:1 or less VSWR. The SE-20M can be also be setup for 17 Meter operation by resetting the reflector and element spacer settings with an VSWR of 1.3:1 or less across the 17 meter band. Constructed of 7/8", 3/4", 5/8" and 1/2" hard drawn 6063-T832 aluminum tubing, 6061-T6 aluminum tubing, UV resistant PVC, and stainless steel hardware. Comes with a UHF female connector, or it can be fitted with a Type-N connector. Heavy Duty construction means the SE-20M Moxon can hold its shape without the need for suspension kits/hangers. Click picture for ordering and additional information. 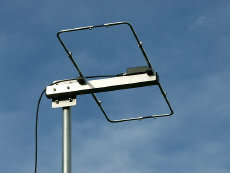 The SE-10MB Moxon is field adjustable anywhere from 26 to 35 Mc. The SE-10MB is light enough to be turned with an inexpensive TV rotor. The SE-10MB can be mounted horizontally for CW/SSB operation, or vertically for FM operation. Elements are constructed of 5/8" & 1/2" hard drawn 6063-T832 aluminum tubing. The balance of the antenna is made with 6061-T6 aluminum, UV resistant PVC and stainless steel hardware. The SE-10MB comes with a UHF connector. The SE-10MB can also be adjusted to operate on the 11 Meter band. Stack two for additional (up to +3 dB) forward gain. Click picture for ordering and additional information. 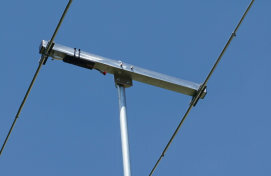 The SE-6MB Moxon Lite antenna is a lighter weight version of the SE-6M designed for rooftop installations, or anywhere a light weight beam is needed. 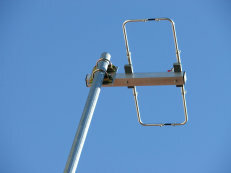 The SE-6MB Moxon Lite is field adjustable anywhere from 48 to 60 Mc.. The SE-6MB can be mounted horizontally for CW/SSB operation, or vertically for FM operation. Elements are constructed of 5/8" and 1/2" hard drawn 6063-T832 aluminum tubing. The balance of the antenna is made with 6061-T6 aluminum, UV resistant PVC, and stainless steel hardware. The SE-6MB can accommodate masts up to 1-3/4" OD, and comes with a 1:1 Maxwell ferrite choke balun with UHF connector. Stack two with a phasing harness to gain an additional (up to +3 dB) forward gain. Click picture for ordering and additional information. 222 Mc. 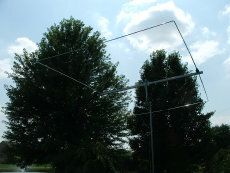 Moxon antenna that covers the 219 Mc. to 220 Mc. Data band and the 222 Mc. to 225 Mc. CW./SSB/FM band with an VSWR of 1.3:1 or less. Constructed of 1/2" and 3/8" hard drawn 6063-T832 aluminum tubing, 6061-T6 aluminum, UV resistant PVC, and stainless steel hardware. Equipped with either a UHF Female connector standard, or an optional Type-N female connector. Stack two with a phasing harness to obtain an addition 2.5 dB to 3 dB of gain. Click picture for ordering and additional information.